There are times in your life when you can see everything coming together in a way that is so perfect and so fluid that you can only stand aside and watch the pieces fall into place, knowing that only divine Grace could so direct the play. Two years ago, on the night after my mentor Ron Roth died, I had a vivid dream visitation; a dream in which my friend Rev. 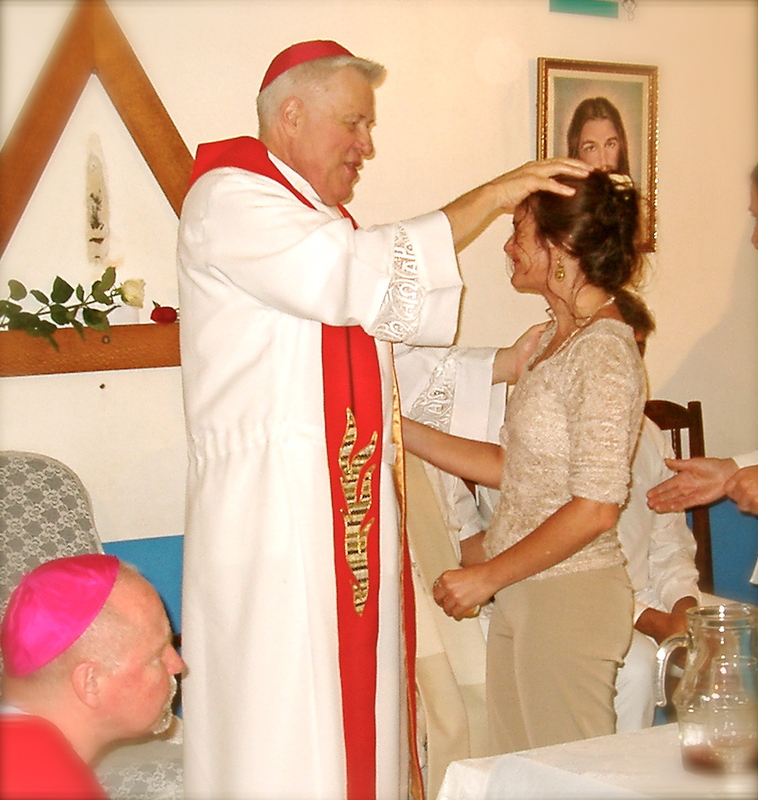 Susi Roos and I were dressing in ministerial vestments in the vestry of a Catholic church. Ron Roth, in full priestly regalia, came charging down the aisle of the cathedral, holding his bishop’s staff and scolding us loudly in his most annoyed tone. “Where are you, I’m WAITING for you!” he said impatiently. He turned back toward the altar, and Susi and I fled down the aisle after him, practically running to keep up. He mounted the platform and we slid into seats behind him and looked out at a vast crowd. 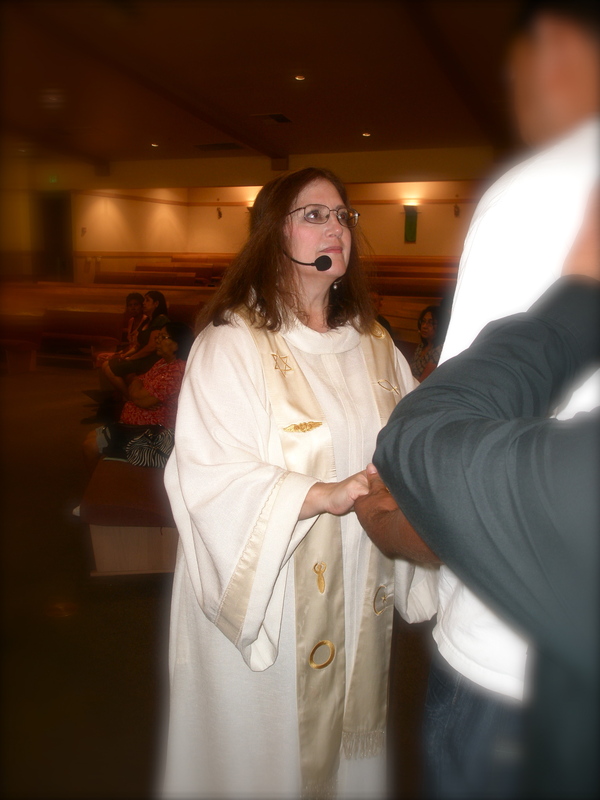 On August 9th, that dream came to life when Susi and I got into our ministerial vestments in the vestry of St. Catherine of Siena Roman Catholic church in Rialto, California. 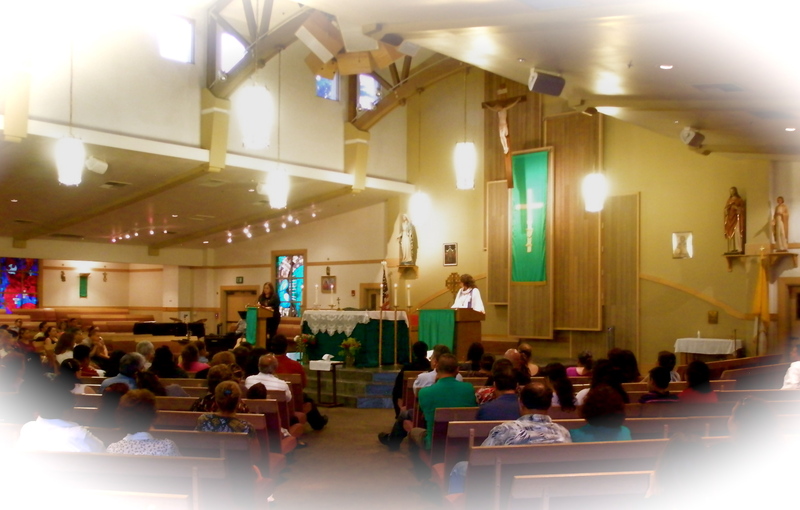 And though Ron was not there in body, he certainly was fully present for both of us and for the people of the parish in the San Bernardino area who came in droves to attend the seminar and healing service Evicting Cancer, which, two years ago when I had the dream, was not even a glimmer in either of our eyes. When I first floated the idea for doing this interfaith educational and healing event past Fr. Steve Porter, whom I had met in Brazil, I did some rapid math in my head. I knew his parish was large, and I figured that among 9000 people, many lives must be touched by cancer. How many would turn out on a weekday or weeknight to hear two unknown female ministers was at best a gamble—I figured anywhere from 10 to 100. But the Holy Spirit had other ideas. Unknown to me when we had first spoken of the idea was the fact that Fr. Steve has conducted regular healing services at his church for years, and had everything and everyone in place to hold a large-scale event that otherwise would have taken a huge amount of logistical arrangements if we were truly starting from scratch—which we weren’t. With Fr. Steve’s enthusiastic support, the first of two events that day had around 300 people in attendance at 10:00 a.m.
A wonderful musical ministry team gave their time to support the services, and to provide translation during our talks as well. After we were introduced in English and Spanish by Fr. Steve, Rev. Susi, who works as both a nurse and a mind/body specialist at a leading cancer treatment facility, spent the first hour talking on the three biggest mistakes people make when addressing cancer, and gave easy and practical things people could do to greatly assist the effectiveness of their treatment. She put all the medical information into a spiritual context, touching on some of the concepts from her in-depth teleseminars and home-study programs. 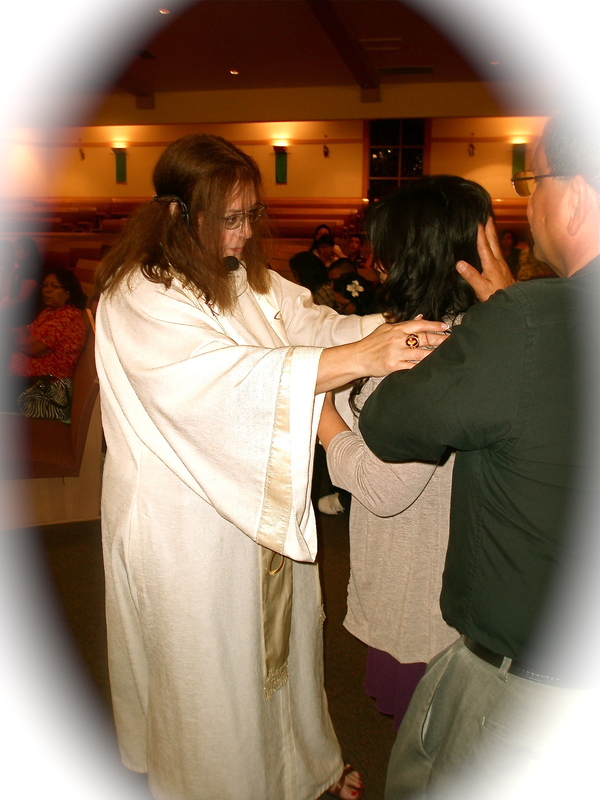 Then it was my turn to open people up to a higher energy transmission through teaching and leading worship (something I’ve done many times on a scale larger than 300 people) and in the laying-on-of-hands healing (something I’ve done in smaller events). Fr. Steve had arranged with one of the prayer groups to provide support, and in accordance with the way they conduct healing services at this church, every individual is personally escorted by a healing minister to come for laying on of hands; the minister stays with them if they go “down under the Power of the Spirit” (involuntarily fall gently to rest on the floor while healing is done on an unconscious level). Rev. 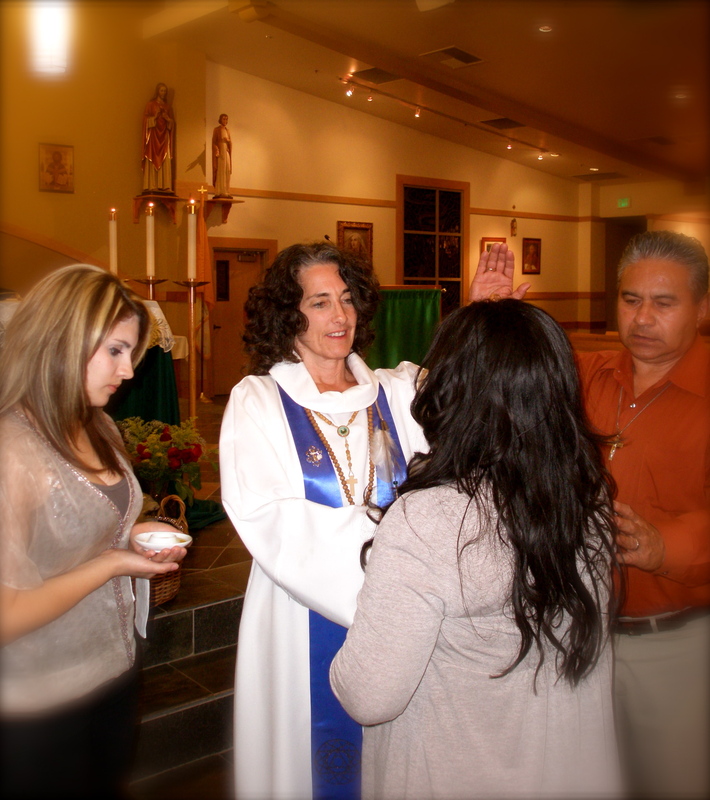 Susi anointing with blessed oil. Our spiritual assistants also functioned as translators as the vast majority of those attending had Spanish as their primary language. I knew one thing: don’t prepare too much, because whatever you think will happen, it will surely be something different. And so it was. Rev. Nettie blesses at the evening service. I was ready to lay hands on people in blessing, but shortly into the personal blessings I was led to look at them in the eyes, and as I did, thoughts would come flooding in, differing from one person to the next, such as “have courage!” or “you are loved…” There was clearly an energy being transmitted through the gazing, and all I had to do was get out of the way and let it happen. I also found myself clearing much “junk”—removing invisible energy blocks before passing people on to Susi, who then anointed them with oil. As she blessed them, many went down under the Power. Fr. Steve moved amongst the people and between us, lending energetic, logistical and prayer support. The morning, scheduled to go from 10:00 – 12:00, continued till 1:00 p.m., as people waited patiently in line for their turn. The evening event began at 7:00 pm, and saw many more people fill the church. This time it was clear to Fr. Steve that at least half were not his parishioners, but those who had heard about the opportunity through friends or through the local Spanish radio station, and had come with hope in their hearts, some bringing children, some with older people in wheelchairs, some holding pictures of loved ones. As the evening went on, the Divine energy in the church became electric; people were open, full of devotion and enthusiastically ready to receive Grace. Reflected on many faces as they approached, was much fear, pain and suffering, and devotion as well. But just under the surface lay a hunger and thirst for love, hope, and most of all, peace—the gifts of the Holy Spirit. The service started promptly at 7:00 and didn’t end till after 11:00. Fr. Steve estimated that we had over 1000 in attendance and about 700 who came up to be personally blessed. I had no idea how many; I could only see the person in front of me, and Juvenal, the human angel who was assisting me, pointed me where I needed to go in the cases of the elderly and wheelchair patients. This time, as the evening went on, as I looked at the person in front of me, I knew within seconds who was physically sick and who was there for emotional reasons. If I asked, they would verify the information and give a few words about their situation. As expected, there were many with cancers, but there were many other conditions as well, often advanced and serious, as well as those seeking help with emotional problems. 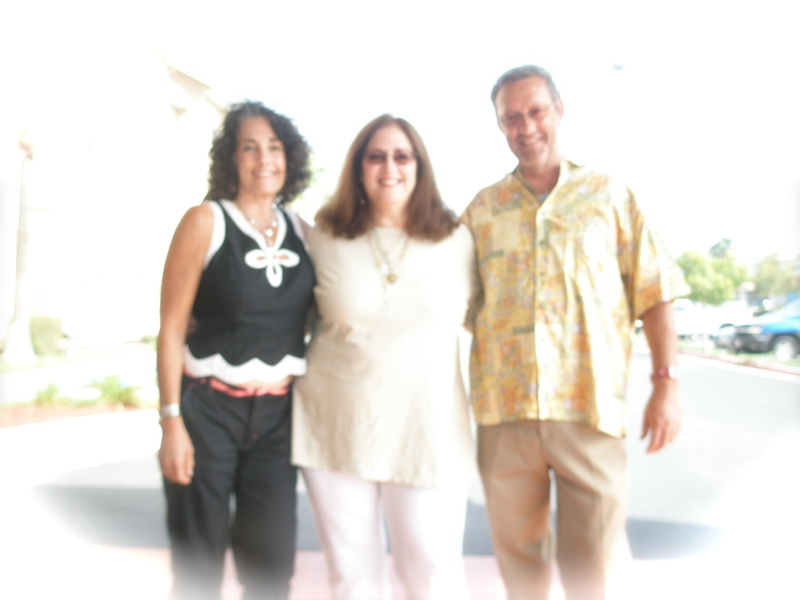 People come to healing services hoping for miraculous help. And what they mean is, on the physical level, they want their cancers to disappear; their ailments—many of which took years and years to establish—to vanish immediately. I’ve been in this world of healing long enough to know that this indeed happens at times, and I believe that when it happens it’s to build faith not only in that person, but in all who know them. More often, a new kind of journey is initiated. Susi quotes her first patient in this field who begged for her help, sensing Susi knew things that could help her, even though the doctors had told her they couldn’t do any more: “You turned my death sentence into a healing journey,” she later said. While I’ve experienced that journey in my own life and witnessed it in so many others—some near and dear to me—that night took everything I’ve ever been through in the world of spiritual healing to a whole new level. I stood at the center of the healing vortex and I could see, feel and know that an energetic transformation had happened for many attendees; that infusion of Divine energy would revitalize them; some in the physical, some in the emotional, some in the spiritual, and some in all three. An infusion of energy always alters that which it touches; it’s a physical law. What’s less well-known is that it is a spiritual law as well. As a result, I know that not only the people who came were changed; I, too, am changed. On August 9th, I was fully used by that purpose. There is no better place to be. For that privilege, I am grateful to God. Our gratitude also goes to Fr. Steve Porter for making this event available to the people of his community, with whom we now share a profound sense of love and blessing. Rev. Susi, Rev. Nettie & Fr. Steve, the day after the services. This entry was posted in Healing, Masters, Prayer, Ron Roth, Spirituality, Stories from the Journey and tagged blessing, cancer, healing, Ron Roth, services, spiritual healing.